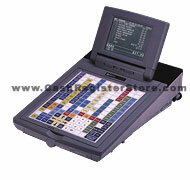 Casio QT-2100 Cash Registers at Cash Register Store.com. The QT-2100 has been designed with a high flexible system configuration to meet various types of hospitality market demands. A small footprint and low-profile design combines w/ a bright LCD display that shows up to 16 lines of 40 characters each. The QT-2100 includes a spill-proof reversible 168-key flat keyboard to allow worry-free operation in food service and bar applications. A large memory capacity (4MB std., 8MB max) provides the business owner with future expansion. 6 RS232 outlet ports enable multiple peripherals to simultaneously be used. Optional equipment includes kitchen printers which can be shared among terminals (up to 4 kitchen printers can be connected in line w/ a maximum cable length of 1 kilometer), receipt/journal printers, rear or remote customer displays, a slip printer (SP-1200), and more! Cash Register Store will program this cash register for $299 and only $99 for each additional machine. NO ONE OFFERS A BETTER DEAL THEN WE DO! All registration keys, mode control, X/Z report control and menu sheet access can be allowed or prohibited for each individual clerk. The system can be configured for a single or multiple back-up masters to suit the required level of system security. The sheet holder attached to the QT-2100 keyboard controls up to 4 different menus. Instead of menu shift keys, menus are changed by changing a setting position on the keyboard. Calculate hours worked and accumulated pay, based on programmable pay rates, job codes and printable employee schedules, as well as manager controlled clock-in/clock-out functionality. Optional memory card allows backing up of system program. Program additional QT-2100's in a few easy steps by transfering program from card to machine. This is a great security option to save your original program. In-line X/Z data collection and consolidation as well as auto programming can be performed using a remote command sent form a personal computer through a modem to the QT-2100.